Every time I visit this city, it finds new ways to surprise me. There is no planning for contingency here. Last week, I returned to Albuquerque for the 40th annual Southwest Popular/American Culture Association Conference to present a paper (animal studies, rats, Paris, Ratatouille, and so on) alongside a broad, interdisciplinary spectrum of scholars. There was an eco-feminist reading of Hey Arnold! There was a close reading of Nick White and Paulo Bacigalupi’s portrayal of toxic water (in the context of the crisis in Flint, Michigan). 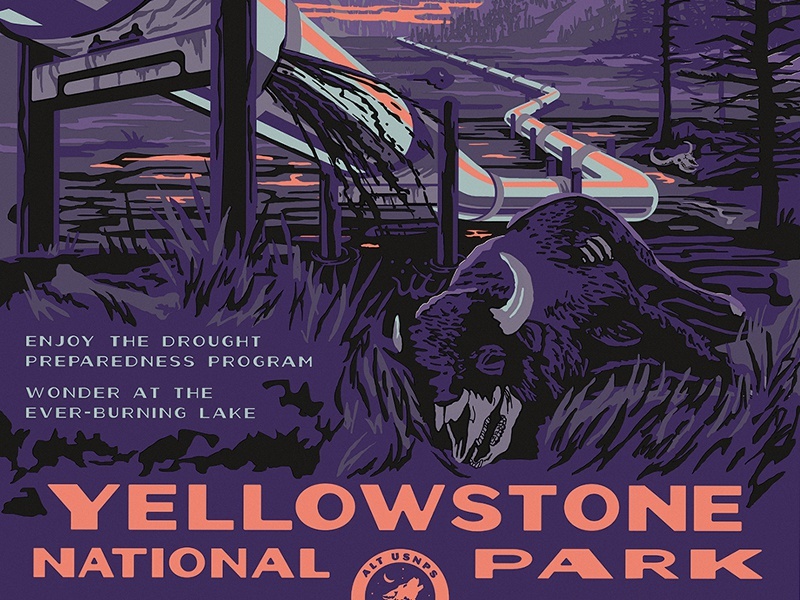 There was a critical assessment of whether or not altering National Parks iconography is a useful political strategy against selling public lands to corporate interests. This conference is my favorite, more than the national PCA conference and even AWP (where everyone is trying to hide how stressed-out they are). Maybe it’s the Breaking Bad T-shirts in the hotel lobby, or the actual meth dealers just down the street on Central Avenue, but for whatever reason, this particular conference allows scholars, an otherwise overly serious bunch, to take themselves just a little less seriously. I’ve missed the high desert, the southwestern aesthetics, the tan and adobe architecture. I’ve missed the sunlight and the dryness. But this is Albuquerque, a city of endless surprise. So I should have expected that the restaurant a friend and I taxied to would be closed in the middle of a snow storm, forcing us to walk down Central Avenue looking for an emergency alternative. Right now, nearly every place that I have known is covered in snow: Flagstaff, Lincoln, Moscow, Spokane, and for a while even Albuquerque, New Mexico. I neurotically plan for contingencies at every step, but it’s good to know that the unexpected isn’t always bad. For me, it takes an effort to relax and take things less seriously. Shout-laughing at the high desert snow while looking for an Italian restaurant in the wind and snow with one of my best friends reminds me that some of the most productive, engaging experiences are surprises, without prediction and against planning. The stakes are high, for interdisciplinary academic work that actually makes a difference. Back home at the University of Idaho, there are two interdisciplinary efforts to address climate change, first an ecocriticism reading group and second an emerging collaboration between the humanities and sciences to communicate accurate climate science to local communities. This weekend, I realized that not only is pop culture necessary to communicating serious climate science, but framing it all as a doom-and-gloom apocalypse is also counter-productive. The most important part of the countless post-apocalyptic films and novels that have come out in the last five years is that, one way or another, people express survival in terms of art. Despite zombies, drought, or plagues, characters always make room for culture, whatever that culture is, no matter how subtle its recreation and preservation is. Popular culture studies finds a comfortable home in Albuquerque. This academic field, like the city itself, resists expectations. It forces people to recognize that grave concerns and lightheartedness can coincide. This conference is an (expensive and limited) opportunity for scholars to “make sense of the things they love.” It’s a space to recognize the ambiguity inherent in everything we interact with: TV, movies, comics, music, genre. All of it has a radical potential to shape the way people see themselves and the world around them. It’s not that pop culture is sacred, but that it has the potential, like the most radical aspects of the world itself, to surprise us. This entry was posted in Academia, Reflection, Travel and tagged academia, Albuquerque, conference, popular culture, Reflection, SWPACA, Winter on February 25, 2019 by keeneshort. In the wilderness, public policy feels far away. But it has effects, eventually, inevitably. There is wildfire damage. There are species, or sometimes the lack thereof. This is the battleground for conservationism, but the conservationists spent too much of their time looking at the soil, not the sky. The air was filled with smoke one day while I was here, and the next day was clear. This place in central Idaho, this last wilderness, is a refuge, a haven. Given the failures of the environmental movement to solidify a real climate policy, or perhaps given the reactionary violence of counter-movements against environmentalism who have doomed my generation to extinction to preserve their precious branding, even public land that is preserved by the strictest laws will be affected by the inevitable. The connections cannot be felt, now, but what happens in D.C. will eventually alter the air, water, and greenery of this place. But this stretch of wilderness, unlike the rest of us who visit it, will not go without a fight. These photographs will, in ten or twenty years, be testaments to what is no longer there, not entirely. Soon, these will be photographs of spatial ghosts. This entry was posted in Reflection, Writing and tagged climate change, Conservation, environmentalism, Frank Chuch River of No Return Wilderness, Idaho, Nature writing, photo essay, photography, Reflection, Writing on October 10, 2018 by keeneshort.